Sue Thompson is a force of nature. She sweeps people along with the power of her personality and radiates an energy that envelops those in her immediate vicinity. She practically ignites the environment with a positive charge. Ask anyone who knows her. They will tell you that she is the “power of positive thinking” personified! Sue adopted an optimistic attitude early in life to overcome a difficult childhood. As she puts it, “necessity was the mother of invention.” She had to create her own positive environment. Learning to cope with things beyond her control and to create a life of meaning and purpose, she chose not to be a victim, but rather to become a victor, a winner, and a leader. What she learned during adolescence became a guiding philosophy that not only led to remarkable personal success in real estate, but also to the foundation for her own company—HomeTown Realtors® in Auburn, California. At the time, Sue was a productive—and happy—agent at Lyon Real Estate in Auburn. Jaya considered the caller’s question for half a second. There’s a lot more to the rap, but you get the idea. When she took that call in 2002, Jaya was a doctor of chiropractic medicine and licensed acupuncturist who had a busy practice, but she dedicated her daily exercise time to study for the broker’s exam. She passed with flying colors and in July presented the license to Sue with the offer to set up her company. Sue promptly got sick to her stomach with anxiety. “I told her she didn’t have to do anything with it if she didn’t want to,” Jaya recalls. But, being true to her nature, Sue embraced the challenge, took the plunge, and followed her dream. She set up shop in her converted two-car garage, using every square inch of space for desks and office equipment for the agents she planned to hire. Sue says it was hard to leave Lyon Real Estate after ten years. She had developed close friendships with her fellow agents, associate brokers and talented assistants. 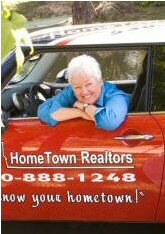 HomeTown Realtors’ first employee was Sue’s personal assistant, Katy Orellana, a dynamo who makes multi-tasking look easy. Katy O, as she is affectionately called, started working for Sue in February 2002 while she was still at Lyon Real Estate. In July, Jaya and Sue encouraged Katy to get her license and, by August, she had it in hand and was shadowing Sue through transactions. Sue and Jaya set out to build a company based on their philosophy that positive thinking leads to positive experiences. They wanted to hire newly licensed agents in order to guide them through their first real estate experiences and teach them to set customer service as their highest goal. 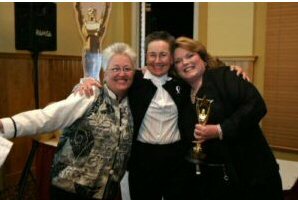 Sue relished the challenge and excitement of teaching new agents her approach to serving the best interest of others. By December Katy had sold her first home, launching her own career as a salesperson. Eventually, she would become the well-respected and admired sales manager that she is now. By June 2003, HomeTown Realtors had outgrown Sue and Jaya’s garage and they moved the office to its current location. But not without some regret. Everyone, it seems, had grown fond of the garage with its big windows overlooking the pond, its complement of shady trees, friendly chickens, and company mascots—two dogs named “Girl Scout” and “Escrow”—ignoring the fact that the office had only two phone lines, one fax line, and half as many desks as they actually needed. “We miss being stacked on top of each other in the garage,” Julie says. “And sharing desks,” Kelly Richardson adds. “And chasing chickens,” someone else chimes in. “And carefully scheduled bathroom breaks,” Katie chuckles. They still talk about lunch at the Taco Tree or coffee at the Starbuck’s around the corner from the garage. Jaya remembers that the last two things the floor person had to do each night were put the chickens in the coop and return the hands-free phones to their correct cradles to be recharged overnight. If the phones went into the wrong cradles, nobody had phones the next morning. The laughter that fills the room when this group gets together is infectious. The warmth and camaraderie is thick and comforting. Sue Thompson and Katy Orellana follow the Socratic method in their training classes. They describe real-life situations or problems in real estate transactions and then ask how the agents would—or could—handle them. By asking questions and waiting for answers, the trainers give their listeners the opportunity to explore the world of possibilities. They are never negative in their approach or response to answers. They keep asking their students to seek other, additional solutions and options. And they invigorate their classes with positive energy and attitudes. Once again, Sue, Jaya and Katy are leading the team in a new direction. Times have changed and so has the way of doing business. Agents and Brokers nowadays have to be ready to ‘turn on a dime’. The technology keeps changing and in some ways that makes it easier and in other ways it makes it more difficult to continue serving and protecting each and every one of our clients. Transactions can move faster in a hot market and slower in a down market when dealing with foreclosures, short sales, and bank owned homes. It is a constant educational process for each of our professional Realtors®. The new direction that we are taking means that we need to be more mobile than we already are. We need to be able to meet you wherever it is that is convenient for you.